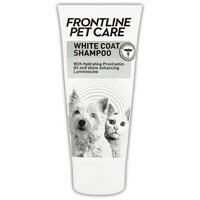 Frontline Pet Care White Coat Shampoo has been specially formulated to enhance and protect the coat of dogs and cats with white or light-coloured hair. Containing Provitamin B5 for long-lasting hydration, the shampoo also contains Luminescine for a natural brilliance and protection against harsh sunlight. The Frontline Pet Care range also contains Rhamnose which will cleanse, calm and protect your pet's coat and skin from bacteria. Having a white coated dog is always a challenge, especially through the winter, but this shampoo makes the white gleam and they smell nice too!